When traveling up and down the East Coast, I make it a point to visit many of the beaches. It seems as though there’s a very definite look to the east coast as well as the West Coast. The West Coast is full of burnt sienna’s and warm tones with blue green water, on the East Coast has cool blues and grays mixed in the scene. But no matter which coast I’m visiting, I never tire of these seascapes with waves crashing on the shore. There seems to be something very powerful, hypnotic and exhilarating about it. 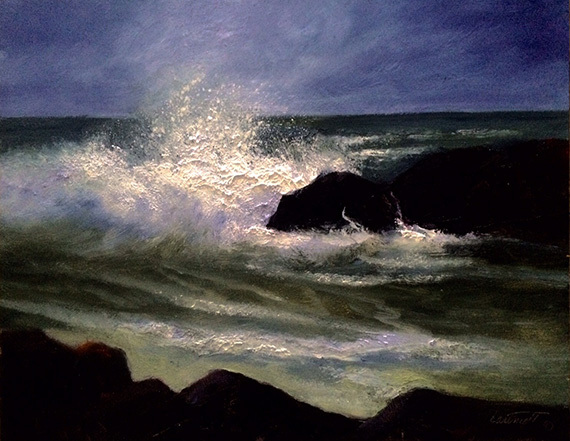 This painting is a 16 x 20 oil on panel, titled after the storm.